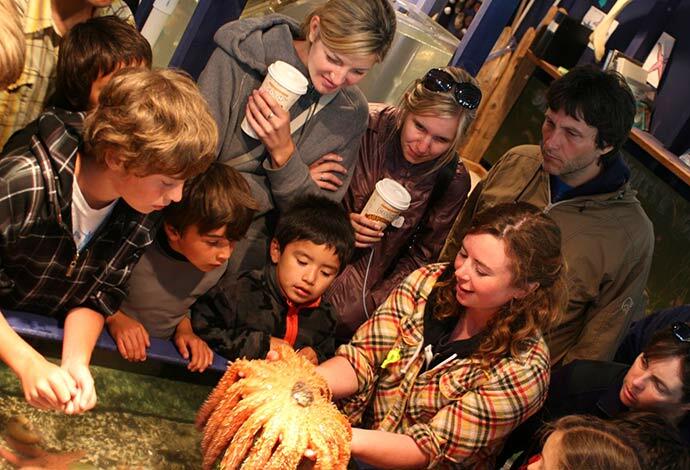 Visitors to the Ucluelet Aquarium can expect an up close and personal encounter with a diversity of local marine life. We provide a stimulating “hands on” learning environment for children of all ages. Visitors can take comfort in knowing that the well being of our display specimens is a primary concern. We hope you will agree by the end of your visit that our aquarium is unlike any other you’ve visited. For one thing, all of our display specimens were gathered in local waters right outside the aquarium’s doorstep. With so many beautiful and interesting creatures to learn about locally, there is simply no need to import species from other regions. Another point of difference is that the creatures you’ll see on display are released back into the wild. Not only does this practice minimize our impact on the environment, it keeps our displays new and interesting. Release days are locally publicized events in which we attempt to involve the entire community. Our aquarium is literally part of the local marine ecosystem. Water from Ucluelet harbour flows directly through our tanks, allowing many animals to find their own way in and out of the displays. Think of these tanks as a system of transparent tide pools connected to the harbour ecosystem. At the Ucluelet Aquarium we don’t expect the displays to communicate for themselves. Knowledgeable staff members are always available to discuss ideas about marine biology, human’s relationship to the ocean, or whatever comes to mind as you ponder the displays. Our staff may even invite you to participate in some of the more interesting aspects of caring for our collection such as feeding a creature or releasing a creature back into the ocean.